Dr Ludlow said: "This solves a long-standing problem that has troubled the dark matter model for over a decade. 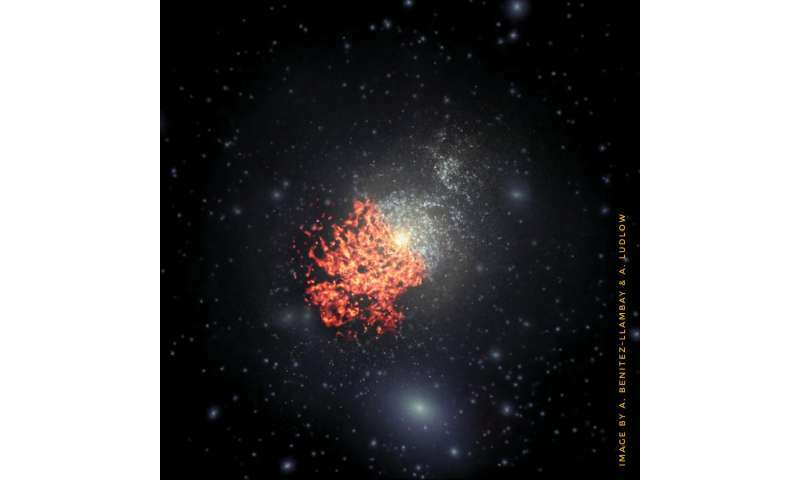 The dark matter hypothesis remains the main explanation for the source of the gravity that binds galaxies. Although the particles are difficult to detect, physicists must persevere." How long before the 'memo' gets through to these 'publish or perish' institutions churning out (for profit) mindless 'graduates' in old myths based on no more than abstract/metaphysical unreal things? Don't these 'research teams' (shades of Bicep2!) realize YET that RECENT, more objective and realistic MAINSTREAM work/developments in ASTRONOMY/COSMOLOGY discovery/review have CHANGED, FALSIFIED all those old BB/Inflation/DE/DM etc assumptions, interpretations, models etc which these OLD 'myths and beliefs' were based? It took many DECADES for Penrose/Steinhardt to finally admit it was all metaphysical 'woo'; having no tenable scientific evidence/support at all. I AGAIN CAUTION against the serious PITFALLS for any 'research team' and 'unreality-based simulation' which EFFECTIVELY 'abdicates' intelligence/logic to 'assumptive maths' algorithms. A "simulation" or "model" is NOT "evidence", ok? While mainstream NOW finding ORDINARY matter everywhere! Wait just a sec here geniuses at Durham.....!!!!!!!!!! The DM Narrative is that it does not interact with normal matter, now you want to do a head fake & tell us it affects the luminosity of galaxies? How is that NOT interaction with normal matter? @ Really-Skippy. How you are Cher? I am good me, fine and dandy, thanks for asking. I take it you don't like this article, eh? What they did in the article makes a lot more sense than the three simulated scientists what have commented so far. But then, I am not a scientist like the three of you guys are not either. So now we got four not scientists commenting on what the scientists are doing, eh? The article's claim should really be a question on a critical thinking test. How you are Cher? I am good me, fine and dandy, thanks for asking. Hi; glad to hear the bot-voting dummy is "good, fine and dandy"! Cripes!....it must make science-Skippys' really nervous and make them hasten to re-assess their own 'work'; whenever a self-admitted bot-voting trolling ignoramus opines that "what they did in their article makes a lot of sense"....to a bot-voting program run by the Uncle Ira ignoramus! Woohee! Watch them (like Bicep2 'team') run for the exits when they are asked in what universe are simulations/models "evidence" of anything except the assumptions and expectations that went into them! Simulate away. No one will ever be able to prove which one of fantasy PhDs has any basis. None really, but no one will ever be able to prove that either. Yet another simulation, and not any real observational evidence. I spent quite a few years writing these types of computer simulations. Given the answers apriori, I could make the programs do whatever I wanted to make them fit. It paid the bills. BS pseudoscience in the comments as usual. There is nothing wrong with simulations. If you can simulate something, chances are you understand it correctly. Which is more than any alternatives to DM can do. The DM Narrative is that it does not interact with normal matter, now you want to do a head fake & tell us it affects the luminosity of galaxies? How is that NOT interaction with normal matter? You dont know what you are talking about. DM narrative is that DM interacts with normal matter at least gravitationaly, and possibly through weak force. It is easy to get the right answer for the wrong reason with a complex 'fudgable' computer simulation, just as it was for Ptolemy & his complex epicycles. So simulated dark matter studies like this are dubious. On the other hand, if a simple theory gets it right without any 'fudging', then that means something, eg: Quantised Inertia. Sad you wasted so much time faking good science for personal profit. Perhaps you should turn yourself in. When will the high priests of academe admit that DM only "exists" because "gravity" needs it, whereas "gravity " is merely an effect we perceive as a manifestation of time, time being our subjective experience of the expansion of all matter in the universe. So by transitive logic it's our subjective experience that keeps us firmly on the ground. Yeah, I like it 'cos no matter where I am my subjective experience will produce 'manifested time' which will produce 'gravity'. The question then is, if I have too much 'subjective experience' will I end up as a personal BH or DM? @Shotman, when I hear someone yammering about "narratives" like in the post you're responding to, I know for sure I'm listening to another sorry deconstructionist would-be philosopher who don't know jack about science. The only reason they're bloviating about "narratives" is because they want to substitute their own. The entire point of the paper this article is about is a response to claims in several recent papers (most notably one by Lelli et al, discussed on physorg: https://phys.org/...ark.html and referenced in this paper as #14) that there is a problem with the dark matter hypothesis. What the paper says is that, in fact, this is *not* a problem for the dark matter hypothesis, and that galaxies with the observed relation between baryonic (visible) matter and their rotation curves emerge robustly from models, even models that do not well duplicate observed galaxy formation dynamics. This clearly indicates that this relation is not a problem for dark matter models; it's a natural occurrence in both dark matter and non-dark-matter models. In other words, dark matter wins again. Just as the title of this article says. I get it, the ones who don't know what they're "talking about" are the ones who challenge you DM Enthusiasts to cough up a test tube full of this stuff as evidence of its existence? INFERRED GRAVITY is a MODEL of gravitational interaction, an assumption, that's what models are. The entire DM Narrative is based entirely on an assumption that gravity throughout the Universe is wildly excessive even as the measurement techniques used to surmise this INFERRED excessive GRAVITY is based on a MODEL. Your vaunted DM model is based on a series of INFERRED NARRATIVES, none of which are based in the Laws of Physics. Because there is no known precise solution to the Navier-Stokes equations, numerical simulation is the technique required to give any solutions whatsoever to them. This situation is general across dynamical systems, and the numerical simulations give good results, including most notably in the design of propellers that do not cavitate for submarines. The famous ability of US submarines to operate in a manner indetectable by sonar is based on these propeller designs, and is proof of the power and correct operation of these numerical simulations. It's obvious to anyone who actually knows how models of galactic dynamics work that this type of simulation is required; and whining about "fudgable computer simulations" ignores these facts. A good way to proceed in this area is to vary the initial conditions across a field of conditions that span the possible and even extend into the impossible, and see what happens. This shows how input parameters can affect the outcome of these simulations, unambiguously. When the results are robust (that is, ubiquitous) across such a field, this indicates that the parameter's value is not important to the outcome. The authors of this paper did exactly that, and showed that the relation that was claimed to "disprove" dark matter is not in fact any disproof of it at all. The relation holds across the field of dark matter solutions, and even extends to solutions that are unphysical, i.e. not observed in astrophysics. This pretty much falsifies these recent claims that there is a problem with dark matter. The link to the arXiv publication of the paper is in the article. Claims that this article, or the paper, are incorrect should be based on realistic interpretations of the data, not prejudice against "modeling" and "simulations," nor on invalid deconstructionist philosophical navel-gazing. @Lenni is arguing against gravity now. It's no surprise, @Lenni is another of the crowd of innumerate deniers. @Lenni engages in the logical fallacy of special pleading and fails, as usual, because it is innumerate. In both cases multiple deconstructionist "philosophers" and denialists made the standard whines and were rebuffed. And it appears that even despite being shown to be absolutely incorrect and to misunderstand the contents of both the articles and the papers they were making misguided and even dishonest comments on, here they are again, making the same unsupported misguided and dishonest claims. Maybe they think that if they shout loud enough they can evade their dishonesty. These individuals are an infestation of science sites. They generally have belief systems that require innumeracy to support, and freely lie. I invite @Reg Mundy to jump out of a tenth floor window without a safety net and come back and tell us all how gravity doesn't exist since it's an invention of "high priests of academe[sic]." Maybe a couple of large men in white suits and a butterfly net would be more appropriate. As far as @RC's claims, particularly "While mainstream NOW finding ORDINARY matter everywhere!" this individual's FUD has been dismissed on multiple threads, and when challenged this individual simply starts lying. I will not bother with the other unsubstantiated and dishonest claims on this thread; they are obvious, idiotic, and risible. We are watching the denier clown car, and it is crashing and burning. Where they make unsubstantiated claims, it is obvious; where they attempt to make substantial claims, they are dishonest. Anyone reading this thread can see it. Here we go again, the plasma ignoramuses grasping at straws (dark ones at that) to prop up their failed guesses. Given the fact that just applying the full electromagnetic and gravitational properties of the matter involved one can not only recreate these phenomena but also explain the full life cycle of galactic formation/evolution without conjuring up faerie dust or scarwy monsters means very little to the pseudoscientific DM experimental science denialists. But alas, why use real science when you can dupe morons like da schnied into believing in their "thought experiments" and in turn them into unwitting cheerleaders of pseudoscientific mumbo jumbo? Real science be damned, the pseudoscientists claim they are on the right track while still unable to find 96% of their Universe. Pathetic. @cantthink69, there is no discussion of plasma apparent here. What is apparent is you trying to dishonestly change the subject to your innumerate and insane fairy tale about the EM force. "There is no discussion about plasma here....", exactly the reason faerie dust must be invented due to the fact of the ignorance of the matter at hand. Not sure how one could possibly be any more stupid than you. @cantthink69, only you would claim that showing there is no discussion of your fairy tale in this thread, this article, or the scholarly paper the article refers to is "proving your point." Whether you are dishonest or insane is the only remaining question regarding your posts. And it is of little interest on a science site. Schneibo, you just continue making it up as you go along.........there can never be "good results" if the model can't be TESTED. The MODEL can't be TESTED until there is something REAL with which to compare it....this is how we do things in our lab. After we create a model, we never go into production with a MODEL until we have built a working PROTO-TYPE for testing in our lab for affirmation that the model will work. However you DM Enthusiasts want to skip the middle feature of the PROTO-TYPE & create new laws of physics with no evidence your new laws of physics will make a PROTO-TYPE work, and your new laws of physics is INFERRED GRAVITY that no one has EVER MEASURED. @Lenni, because you are innumerate, you have nothing to say that is meaningful about science, the Navier-Stokes equations, astrophysics, testing, simulations, models, plasma, the scientific method, peer review, mathematics, or anything else for that matter. If you cannot you yet again demonstrate you are a liar. And it is of little interest on a science site. As it goes, the plasma ignoramuses are running amok while demanding we believe their faerie dust delusions. @cantthink69, the only sorry one is you, with your EUdiotic fairy tales, attempts to change the subject to plasma when it's completely off-topic, and inability to face your dishonesty. The dishonesty is in fact being resorted to by those who prefer to ignore the known properties of the matter that pervades the Universe. @cantthink69, now you're lying again. What "matter that pervades the Universe" and why does it matter? You are making another grandiose claim without ever specifying what it has to do with "plasma," without making any claim of some particular argument, or providing any reliable evidence either that your claim of a phenomenon is real, or that it has anything to do with any particular hypothesis. 1. Make a verifiable claim. 2. Provide evidence to support the claim. These are fundamental procedures, and you seem unfamiliar with them. Without them nothing that has anything to do with science can be accomplished. It's all fairy tales. One can read the article, see a claim, and see evidence for that claim. One can do the same with the referenced paper. You cannot do either. Please attempt to remain in contact with reality when posting on the science site. Thanks. Getting lots of organizations to fund your computer simulations is impressive, but imaginary matter does not become less imaginary when it is simulated on a computer. @dogbert, you seem unfamiliar with what is being claimed in the paper and the article. You also seem unfamiliar with how computer simulations are used. Since I presented this above, it also seems you have trouble reading. Perhaps you should read a while more before posting again, and this time try to actually understand it. Your comment, aside from its intentional insults, supposes that because computer simulations of real phenomena can be useful, simulations with imaginary particles somehow prove the existence of those imaginary particles. I don't have a problem reading or understanding. I do know that computer simulations can have various real world uses. But computer simulations of particles which we simply made up one day over 80 years ago and of which we have not found a single instance, cannot be validated or proven by any number of simulations.You could do the same simulations with pixie dust by giving pixie dust the same properties and you would not have proven the existence of pixies either. Schneibo, your math is as UNDETECTABLE as your precious Cosmic Fairy Dust. What "matter that pervades the Universe"
Plasma, the "fourth" state of matter. The observable baryonic matter in the Universe is 99.99% plasma, this is an indisputable fact. Because of the known properties of plasma, where EM forces dominate the puny short range effects of gravity by at least 39 orders of magnitude. Again, an indisputable fact. Unfortunately, it still appears, @dogbert, that you understand neither the article nor the paper. Neither is about "computer simulations of particles we simply made up one day over 80 years ago." Nor is either about validating or proving anything about any such particles. In fact, from an astrophysical point of view, it doesn't matter whether dark matter is particles, or some more exotic alternative. And this, also, seems to be something you don't understand. Maybe if you didn't make up fairy tales about astrophysics you'd understand better. Just sayin'. LOL @cantthink69. Of course it's 99% plasma: most visible matter in the universe is stars. Duhhhh ummm. As for stars being powered by "EM forces" you don't bother to specify, first, stars are powered by nuclear reactions, driven by the strong nuclear force which is considerably more powerful than EM, and second, if stars are powered by electricity, where is the electricity coming from? Dumb da dumb dumb, dumb da dumb dumb duhhhhh. That makes you even worse than a bot-program on a science site; because you choose to behave like a bot-voting program whenever it suits your ego-needs instead of objective science. As for being a bot per se; the frequency and indiscriminate nature of the bot-votes is what a bot-voting program does. Uncle Ira employs a bot attached to his account which he has admitted he is too stupid to know how to un-attach it; so he lets it do its 'thing' skewing the metrics on a science site, with the encouragement and acquiescence of unprincipled anti-science types you have just self-identified as with the above trolling post. Very disappointing, LG100. Do better; stick to science, logic; leave the malignant bot-voting and trolling to the usual 'gang' doing that here. Thanks. @Da Schneib If the result is invariant with respect to a wide range of input parameters, then there should be a simple hand wave that connects dark matter to luminosity. In other words, there should be a widely universal result in there somewhere. If I was still practicing, this is what I would focus on. Don't you have a ToE to finish? There is nothing wrong with simulations. Any good objective scientist knows full well, and will tell you so, that unless 'sanity tests' are applied to identify and remove unwittingly included unreal and/or illogical assumptions, techniques, algorithms, methodologies and other 'modeling' biases and unreliable data sets from the 'design stage' of the 'simulation', then it will be nothing more than GIGO (garbage In Garbage Out), the results/conclusions of said 'exercise' therefore being more likely to mislead than to enlighten. As for COLD DM simulations: please note that even Carlos Frenk (one of main architects/proponents of the CDM 'explanation' for the gravitational/motional observations) finally admitted that, when he finally simulated the HOT DM case, the differences in the filament-and-void 'network' structure resulting in both cases was minuscule. So, no claims of 'certainty' can attach to ANY simulation so far at the cosmic scale. This clearly indicates that this relation is not a problem for dark matter models; it's a natural occurrence in both dark matter and non-dark-matter models. In other words, dark matter wins again. Your/above author's long-inculcated 'confirmation bias' is breathtaking. Your/their 'interpretation' wants it 'both ways'. Have you/they already 'conveniently forgotten' recent mainstream discovery that motions in MW correlate (closely track) with visible matter content/distribution? This implies that IF 'exotic' DM existed at all, it would be closely associated with/follow along with, the distributions/motions of ORDINARY (in various excited/ground states) VISIBLE matter (of which we NOW finding humongous amounts MORE of that was previously 'dark' to our instruments and hence led to previous seriously UNDERESTIMATES for ordinary/visible matter in our galaxy/beyond). Hence there is NO 'need' for 'exotic' DM; it's ordinary stuff. So 'exotic' DM NOT 'winning'. Because there is no known precise solution to the Navier-Stokes equations, numerical simulation is the technique required to give any solutions whatsoever to them. This situation is general across dynamical systems, and the numerical simulations give good results, including most notably in the design of propellers that do not cavitate for submarines. Simulations should be separated into two distinct classes reflecting their reliability and capability of being DIRECTLY tested as to their validity in reality (as distinct from just 'agreeing with the model'). Your example of simulating/modeling propellers falls into the 'directly testable' category. In fact, what you describe is a form of 'TRIAL and ERROR' approach, using a mathematical model to start from rather than a pure random guess. We can NOT 'test directly' for sumulations/conclusions involving cosmic scales. Hence use caution when 'believing' such simulations. Thanks. Depends on which 'aspect' of the gravity phenomena one is addressing. There is the purely descriptive/quantitative calculations/relationships being modeled via abstract 'spacetime' construct. THEN there is the question of what actually causes the energy-space effects that produce what we observe/describe/quantify purely in terms of the energies/motions of test-bodies etc affected by gravitational fields. So you are correct, Whyde. Neither GR (other 'professional' speculative hypotheses) actually explains gravity, beyond using 'inferences'. ...and the reality-maths too, don't forget! Anyhow, as I explained before, I still 'soundboard' and try to keep up to date with science news/discourse; and PO site is a 'one stop shop' for doing both! Cheers. And, so too is most of the matter in between the stars and galaxies. So dum dum, as acknowledged, nearly all of the matter that pervades the Universe is plasma. And we know for a fact that plasma is dominated by electric and magnetic fields (EM forces). Talk about dumb, change the subject much? Man, you are approaching Cap'n Stoopid's kind of Stoopid. ..and the reality-maths too, don't forget! Anyhow, as I explained before, I still 'soundboard' and try to keep up to date with science news/discourse; and PO site is a 'one stop shop' for doing both! And it's the only shop you are still allowed to shop in too. Well now Skippys & Skippettes, I could finish up working on my toes that will shame Newton and Einstein and answer every unanswered question left in science,,,, or I could shop around some gobbledygook at the PO,,,,,, hard choice, eh? - in a very sorry state due to damage 'paddoboy' etc trolls did; got rid of them, realizing (too late?) just how poisonous their 'protected trolls' were. Oh, and what the Uncle Ira bot-voting ignoramus calls 'gobbledegook' is being confirmed correct by mainstream of late. Correct science is 'gobbledegook' to a bot-voting dimwit. Sad. ,,,, that you was not slick enough to sneak back in? The internet experiments where the mod-Skippys kept realizing it was you and made you stay banned? If I was you, and I am glad I am not you, I wouldn't want to be calling attention to those experiments. Anyhow, as I explained before, I still 'soundboard' and try to keep up to date with science news/discourse; and PO site is a 'one stop shop' for doing both! Cheers. Is "soundboard" a euphemism for "I don't actually have a real ToE, but if someone presents one on here, I can claim it as what I've saying all along..."? There seems to be a fair bit of argument about the use of simulations so I thought I'd just add my 'pennyworth'. First, let's get it into perspective. A simulation of any kind is an IMITATION of some real event(s); so by that definition experienced users understand what they have. In a very weak sense mathematics does the same thing, we use maths to MODEL reality...and that is so whether one uses for or against, say, GR. I have a relative whom is a vehicle crash expert and Crash Simulations are extremely important in the development of better safety measures. I am guessing, but probably most of us here drive automobiles (with the possible exception of 'cantdrive85', Ha!). So like it or not we depend on these people to provide us with possibly life saving technology. I understand that in actual crash tests simulations do come close. ,,, that you was not slick enough to sneak back in? The internet experiments where the mod-Skippys kept realizing it was you and made you stay banned? ...I wouldn't want to be calling attention to those experiments. I got back in for the experiment under different (necessarily!) usernames and tested the rules/actions of the mod-troll gangs by sticking to science while they again colluded as of old to frame and ban. Proof was ample and quickly forthcoming, thanks to the many 'protected trolls' stalking, baiting and sabotaging to the point the victim was banned while the perpetrators were rewarded with a token slap on the wrist. It was blatant and malignant to watch/expose it so easily and objectively. Anyhow, just go back and see how SORRY they are NOW; they HAD to get rid of their 'protected trolls'! As you will have by now gathered from my posts, there is NO argument re the directly testable category of simulations. Because, as I pointed out to DS, those types are basically 'trial and error' SERIES of simulations which are adjusted as they go long in the series of 'runs' until the results match (or seem not to match no matter what is tried) what is OBSERVABLE and TESTABLE directly RIGHT THERE in front of the scientists/technicians. You also seem to agree (with me) that at the cosmic scales much caution needs to be used when designing, assuming, interpreting etc etc in such cases which will NEVER BE directly testable 'right there' in front of the scientists/technicians. Your attempt to rationalize away this inescapable objective factual situation, only increases your bias potential (as indicated by your saying in the case of this article, "I agree with Da Schneib", even though he is still missing the point made about discerning simulation 'categories'). After we create a model, we never go into production with a MODEL until we have built a working PROTO-TYPE for testing in our lab for affirmation that the model will work. ... and your new laws of physics is INFERRED GRAVITY that no one has EVER MEASURED. Very well said Benni, you get it. Modeling and simulations are fine and dandy, if and only if, you can test them with real physical objects in the real world. Anything else is as good as throwing poo at a blackboard. Mmmmm, you should probably read the paper. They seem to be focusing on feedback both among the motions and gravity of the stars, and with or without AGN. Their main finding is that the range of results they get across all these models shows the same mass-discrepancy acceleration, the very one that was previously claimed to be a problem for dark matter scenarios. This rather neatly shows that in fact it is not a problem at all. @Mimath, one of the important points about using computer models is that you tune the parameters until you get results that reproduce observations, and make conclusions based on the ranges of those parameters. If you can only find a very small set of parameters that reproduce reality, then you've found the likely values of those parameters; if many or most models reproduce reality, then you've found a general principle and that's important too. When you read a paper on simulations, it's important to understand which of these techniques has been used. "I used to write programs"
Or (U-U NOT) = 0 ? Is NOT being used as a logical operator? Reverse Polish? Have you assigned some other meaning to it?" Can you answer those questions? And if so, will you? Glad I don't have to try to find and fix the bugs a "programmer" who doesn't know any math made. Can you imagine the mess such a person would make trying to write a program that deals with dates? Who chose that particular variable of Universe? I think it was RC, wasn't it? Then there's leap years. That's where it gets really interesting, mathematically speaking. You raised the question of knowing what goes into constructing a simulation. I answered the programming aspect in addition to all the previous aspects I covered already. Meanwhile you just 'excerpt and strawman'. Not good, Zerg. As for your persistently misconstruing the posted form into a form which makes it a NON-real and incorrectly notated form, that is your problem. Apparently you are not familiar with the 'struck-out' = sign denoting "NOT=". Sad that you need to SEPARATE the adjacent 'integrally combined' "NOT=" into your 'strawman' parenthesis aggregation, Zerg. Shame on you; wasting your time/intellect on such lame contorted strawmen and shonkily manufactured cheap shots. Man, you're "doing it again", Whyde; and "not even realizing it"(remember?). You have no idea what is being discussed or who it is that is misconstruing and misattributing to beat the band (ie, it's Zerg; as my above response to his silliness demonstrates to anyone understanding the issues/conventions involved...and who is the one misusing same for strawman/cheap shot motives). So Whyde, don't make it more sad that it already is on the part of the trolls you appear to still be 'preferring' above objective science/logics discourse. Do better. Go back and read and try hard to understand the point I made and the forms being used by DS/Zerg and me....and try hard to 'get' the important differences, in logics and reality terms. Ok? You're still fantasizing some 'version' so that you can say what you want to say without actually needing to be correct about the person you are fantasizing about. Stop it before you become obsessed with the 'unreal version' of reality which you appear to be constructing as you 'chat' with equally self-deluded 'strawmen world' builders. Sad. @RC, the lies you tell are documented fact, present in every post I make in response to you. You've just pretended @Zerg was wrong or misrepresenting your own words- which were ambiguous in exactly the way he says. It's not his fault your pseudo-code was ambiguous. He just pointed it out. So you just told another lie. Schneibo.......in all seriousness, you really need to find a different retirement career. You come on a science site applying the Inverse Square Law in a manner in which maximum gravitational attraction of a stellar body occurs at its center. Or your twisted physics of applying KE=1/2mv² to the Escape Velocity of electro-magnetic energy. Why do you continue imagining that those of us who are serious about applying the proven Laws of Physics have any interest in this kind of convoluted & twisted tripe? Definitely you are in for a career change, and this isn't the place for those who don't want to be serious about applying the observable & measurable Laws of Physics. Facebook would be a good place for your rantings & name calling routines. I'll bet you could find a special section there for over the hill Trekkies who think just like you do. Man, you're "doing it again", Whyde; and "not even realizing it"
I have every idea. You can't functionally place the "Universe" in the same objectified manner as an apple. We're on the INSIDE... Reference frame is completely different. You come on a science site applying the Inverse Square Law in a manner in which maximum gravitational attraction of a stellar body occurs at its center. Aren't you the one actually doing that? Or your twisted physics of applying KE=1/2mv² to the Escape Velocity of electro-magnetic energy. How else do you explain the need to apply more power to a radio message to a spacecraft? and given you just demonstrated you don't understand photon momentum I'd say you never will. I'd also say that anything an innumerate claims about inverse square laws is bloviation. @RC is having some trouble in that thread too. I love the smell of burning hair in the morning. Especially when it's burning from the skull outward. @RC's having some trouble over there too. Sock puppets? Just askin'. Only "ambiguous" to reading confirmation biased trolls who prefer cheap shots/strawmen above actual fair comprehension in full context and discussion on same, not kneejerk versions created by trolling ignoramuses like @ZergSurfer above (@TehDog troll hasn't 'changed its spots', obviously). You frequently boast/pride yourself on NOT READING properly or at all; and you patently are NOT UP TO SPEED with all the recent mainstream discovery/review, on many fronts, increasingly confirming me correct all along; and increasingly making your OLD 'wiki-based' so-called 'knowledge base' OBSOLETE. Now how on earth can you stand there and pretend to be in any way equipped either intellectually or informationally to call me names? DS, step away from that keyboard and take a long break and get help to cure your self-evident manic obsession with insulting people on the net while remaining woefully ignorant as you do so. Which makes it more tragic. Now prepare for a demonstrating pointing out the cause of your intentional but mistaken "doing it again"..
You got that precisely THE WRONG WAY ROUND! It was DS and Zerg keep insisting that the abstraction of "Apple-Apple=0" is also applicable in treating UNIVERSAL REALITY. I demonstrated the inadequacy of their abstract formalism by the UNREAL "Universe-Universe = 0" expression based on their UNREAL maths. See? It was ME TELLING THEM that THEY CAN NOT just 'treat' REAL UNIVERSE like some abstract 'Apple unit'. Hey Schneibo, you're the one who doesn't comprehend the equation regarding Mass/Energy Equivalence Principle in SR. If you did you wouldn't continue with your manic rampage in trying to subordinate the Escape Velocity of a photon to KE=1/2mv². Just live out retirement quietly & leave science to those of us professionals who know what they're doing & who know how to sort out Partial Differential Equations from Differential Equations. "See? It was ME TELLING THEM that THEY CAN NOT just 'treat' REAL UNIVERSE like some abstract 'Apple unit'." Wait, apples are an abstract construct? What have I been eating all these years? "Apparently you are not familiar with the 'struck-out' = sign denoting "NOT="
Strike thru is used in math, not code. @RC, code is a formal language with fixed interpretations set by the compiler. That you do not understand this makes it obvious that you cannot ever have been a successful commercial ro scientific programmer. So you lied again, and also proved you are innumerate again. @Lenni, you're lying. It seems to be the go-to strategem for the la Violette/EUdiot crowd. I never claimed a photon has kinetic energy and challenge you to show where I did. I claimed a photon has momentum, which if you look at that equation-- the central equation of Special Relativity Theory-- has an obvious meaning. What I did do was point out that the kinetic energy equation is derivable from that SRT equation, and challenged you to derive it. That you cannot is the thing you are trying to hide by lying. Many readers are NOT coders OR mathematicians; hence the post/explanation is directed at them as much as anyone else. Your 'exclusionary' approach to discussion here is what makes you so damaging and irrelevant so far (and what led you/gang to fall so 'uncritically' for that Bicep2 crap). Do better than just grasping at any little thing in order to strawman and take cheap shots while missing the science/logics point made for YOUR benefit as well as all the other readers here. Thanks. @RC, code is a formal language with fixed interpretations set by the compiler. That you do not understand this makes it obvious that you cannot ever have been a successful commercial or scientific programmer. "Many readers are NOT coders OR mathematicians; hence the post/explanation is directed at them"
Then it behooves you to be clear and unambiguous in your example. You weren't, and you have yet to clarify it's meaning. So, we can put that one to bed, hey, Zerg? And I trust you will continue as perspicaciously as you (finally) demonstrated you could be in that other thread/post; for which, again-----Well done, Zerg! Is cheap shots now your thing too? Read the posts before you carry on heedlessly spamming your mania and your newfound cheap shot tactic. Read and learn instead of ignore and spam your nastiness. You are only distracting from the science discussion and cluttering up threads with your ego-tripping attacks and in-denial accusations. Couldn't you see Whyde was just kidding with that? I see that you, me, Benni, and the rest of us who post meaningful comments are still being downvoted by the bot crowd, whilst Da Schnickelgruber et al are getting 5's. I have to wonder why the sickos waste their time doing it, as any discerning reader automatically reverses the vote order when considering posts. Time the ratings were discontinued so the morons had to find some other way to vent their venom. Aah, poor RegM, don't be shy now, tell us what you really think. @Da Schneib Did mean to ask you. What kind of computer system are they using for the simulation. I ask because it has been about 23 years since I worked with large data bases. And you can't comprehend why people ignore you and down vote you. Ignore it is. Wow! Did I rattle your cage? ERRATA: This edits my previous post to @Zerg. Apologies for double post. They also used hydrocodes (this is software that simulates hydrodynamic interactions for input into larger simulations) called GADGET 3: http://wwwmpa.mpa.../gadget/ This is apparently leading-edge hydrocode. All of the code used is public access one way or another. DiRAC tailors computing clusters for specific projects, suiting the resources to the requirements of the project. Specific details like numbers of nodes and cores are not apparent, but you might be able to find out with some research or by emailing the authors of the scholarly paper (you can get them from the arXiv link in the article above). Users of such simulation software are assumed to be capable of finding the code on the Internet (since it is open source) and evaluating it competently. Obviously there are certain users here who are flatly incapable of this since they don't know physics, don't know math, and don't know programming. But these programs are fully public, and the fact that this paper has been published in a peer-reviewed scholarly journal of record indicates that the code has been reviewed and found correct; the paper would have been rejected in peer review if there were any questions about it. This procedure is becoming increasingly common as code bases for these simulations are used more and more in research. This is particularly true in situations that require simulation since there are no exact solutions to the Navier-Stokes equations and they can only be evaluated with numerical simulations. @Da Schneib many thanks for taking the time to reply. Much appreciated and I'll look up some items you recommend. I knew a little about programming years ago but haven't studied it in detail only what was required by the company I worked for and related specifically to my job. So I fail miserably on that score. I am aware, as a layman, of N-S theorems with regard to flow/continuum problems but only through basic vector analysis (simplified versions for aerodynamics). Certainly nothing complicated like what might be used in numerical programming and applied to simulations of the type we are discussing. Once again, thanks. @Mimath, glad you found it helpful. There have been quite a few developments on this front as clustering solutions to supercomputing have come online over the last couple of decades; ten years ago you'd have found detailed documentation on core or system counts, and more, in a scientific paper of this type. These days, they are taken as de rigeur, and even in some cases the links to the public software code are omitted in the assumption that anyone educated enough to be reading the paper in the first place already knows how to find them. That rather leaves us laymen out. That said, this particular paper is a "letter," not a full report of findings; this is implicit in the journal it was published in, and such shortcuts are permissible, as long as the expected audience can be assumed to be capable of looking up the code without extensive assistance. So it's no fault of yours. @Da Schneib you say '...us layman...' You certainly are a lot more informed than I, don't view you as a layman, Ha!. Briefly looked at the link you provided so over the next few days I'll check it out as time permits. Thanks again.